My daughters are on the petite side. One in particular has a difficult time finding belts that fit, without shopping the kiddie department. I shopped and shopped for a leather belt that would fit, as a gift for her for Christmas. What I finally settled on was still too big for her, but I knew I could add holes so it would fit better. This week, I finally got around to taking her measurements and adding a couple of extra holes. I measured the distance between existing holes, and marked with a pencil, where to add new holes, keeping the spacing uniform. I placed the belt on a cardboard box (so I wouldn't drill holes into the kitchen floor), and with the electric drill and one of the smaller drill bits, I drilled a pilot hole. I changed out the drill bits about 4 times, increasing the size of the holes incrementally, until "my holes" were about the size of the existing holes. Voila! About a 5 minute job, and now the belt fits. Sometimes, the manufactured holes in a belt have some of the stain from the surface of the belt, on the inside of the holes. This can be approximated with a sharpie pen, in either brown or black. In addition to fitting leather belts for my daughter, it has occurred to me that this method will work for second-hand belts for my husband. My husband also has a small waist. (I wish my daughter's tiny waist came from my side of the family, but sadly not.) Finding a leather belt that fits him means paying full-price at the mall. The belts that we find at Value Village, St. Vincent de Paul's and Goodwill are never quite small enough. But I often find one that is just 1 or 2 inches too big. In the future, these belts will work for him, as I can add extra holes with the electric drill. One other use for adding holes. My belts (from pre-baby days) are not too big, but a tad too small. I can add an extra hole to one of my favorite belts, so that it fits again. Oh, so, so sad, that I have to make belts smaller for some in my family, but bigger for me! It's such a feeling of triumph, to fix something you own so it works for you! Good luck with your husband's belt! In my early days as an OT, I worked in a psych unit. 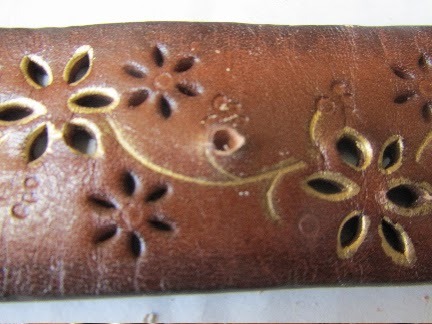 We did leather tooling and punching with the residents so this put me in mind of those long-ago days. :) No need to make belts smaller for me!!!!!!! Boo! 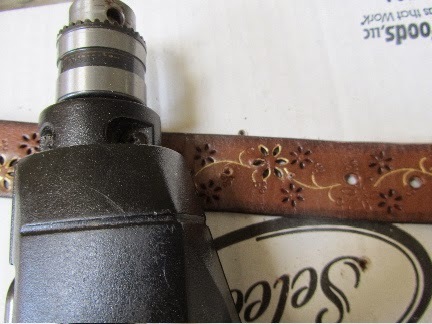 I was telling my kids about how we tooled belts when I was in middle school. It was such a fun project! I wore that belt for several years. You and me both -- I'll be adding an extra hole on the other end of the series of holes on a belt for me! When you make the belts smaller, do you ever have the problem with too much hanging off the end? I have that problem sometimes. Even if you put the extra end into the next belt loop, it never stays. For the very best look, you're supposed to take the extra length off the buckle end. If the belt was an expensive and very well-made one, I'd take it to a shoe repair shop to have them remove the buckle, shorten the belt and put the buckle back on. But, for less expensive belts or belts that will only be worn for a couple of years (due to growth/styles changing), taking length off the non-buckle end makes more sense. If the belt does not have stitching around the edges, you can take an inch or two off the end with a razor knife and a sturdy metal guide (like a carpenter's square). You can do two 45 degree angles then a straight cut in the middle, for a reasonable look on a casual belt. 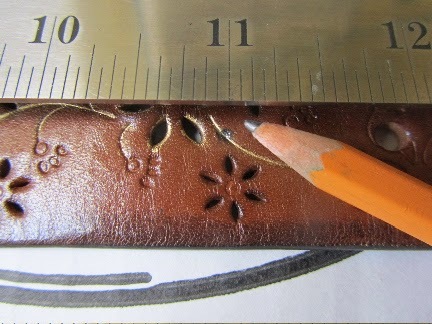 Then stain the cut belt edges to match the rest of the belt, with a brown or black Sharpie pen. This takes a lot of arm strength, and perhaps practice on a spare belt. So, for us, I won't be shortening my daughter's belt, but instead moving that loop over. The loop is on a short tether on the backside of the belt. When I get a chance, I'll cut the tether, move the loop down the belt, and glue the back side of the loop to the backside of the belt (so the loop stays put). This belt is one for her to wear with jeans, so the belt loops on the jeans are about enough to hold the extra length in place. She may fill out in the next year, enough to start using some of the original holes. So I'm reluctant to make any really permanent changes. 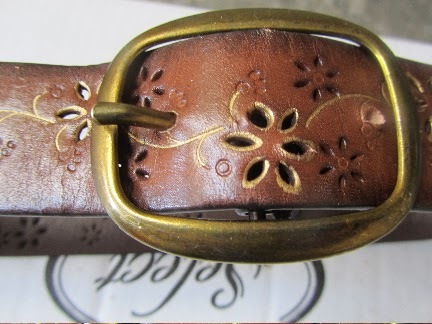 For belts for my husband, I think if I find a dress belt 1 or 2 inches longer than he wears, that amount of extra length should do fine going through belt loops on his slacks and the loops on the belt itself. If his belts flop around too much for his likes, we can always add a bit of velcro to the back side of the belt end and front of the belt where they would line up when he has it on. Thanks for the info, Lili. Velcro--that's a good idea. Sometimes I use it instead of replacing a zipper in pants. Works fine and so much easier.